Placing a Bible in the hands of every Christian believer is a task that the global body of Christ can accomplish in this generation. Here at The Voice of the Martyrs, we are committed to making it happen in countries where Christians are persecuted for their faith and we need your help. Together we can make sure every Christian in a hostile area or restricted nation has his or her own Bible. In recent years, thanks to the generous support of American Christians like you, VOM has been able to distribute more than 1 million Bibles each year on the world’s most difficult and dangerous mission fields. We know precious persecuted believers in these nations by name, and VOM staff members have witnessed firsthand their joy when they receive their first Bible. One way enemies of the gospel try to prevent the spread of Christianity is by restricting and destroying Bibles for children. They know that if they can indoctrinate children with other beliefs — radical Islam, communism or some other anti-God philosophy — those beliefs can last a lifetime. The Voice of the Martyrs is counteracting this by putting Bibles in the hands of our youngest brothers and sisters, helping them prepare to stand courageously for their faith in Christ. No road is too difficult, no risk is too great when our brothers and sisters are crying out for God’s Word! Smuggling Bibles into countries where there is no access to God’s Word is a vital part of strengthening the church in those nations. Take time right now to pray for the safe distribution of Bibles in the world’s most difficult and dangerous mission fields, as illustrated on this map. Brave men and women are risking arrest, imprisonment, beatings and even death to get God’s Word into the hands of those who otherwise might never receive it. In many Central Asian countries, Bibles are considered propaganda and are not allowed to be imported or printed. VOM supports covert Bible operations in this region so Christians have access to God’s Word. 2014, when ISIS invaded Mosul and surrounding areas of the Nineveh Plains that had been home to generations of Iraqi Christians, the Islamists systematically burned churches and Bibles. VOM provided new Bibles to replace those destroyed. Last year, the government banned the online sale of Bibles, an additional obstacle in a country where printed Bibles were already difficult to obtain. The Communist Party is also working on a new Bible translation intended to inject Chinese values into Scripture. As the government tightens its control of religious life in Cuba, Christians there fear it will become more difficult to get Bibles. Over the years, believers have used a variety of ways to bring Bibles into Cuba, including by boat, by hand- carrying individual copies and through government-approved shipments. If caught with a Bible, Ri Gun would be sent to a labor camp … or worse. So she tucked her small Bible into the fronds of a special mop intended for cleaning the portraits she was required to display of former North Korean leaders Kim Il Sung and Kim Jong Il. VOM workers smuggle both print and digital Bibles into the country. Together we can make sure every Christian in a hostile or restricted nation has his or her own Bible. “Give us more!” the robbers demanded. It was 9 p.m., and Faisal’s Bible distribution team was eager to be home. After delivering Bibles to eleven Pakistani villages in three days, they had taken a shortcut to get home faster. But as the team slowed their old van to navigate a bumpy stretch of road, they found themselves surrounded by a band of robbers notorious in that part of Pakistan. Rajehs, one of the workers riding in the van, tried to reason with the six armed men as one of them pointed a gun at the driver and another held a gun against a passenger’s leg. “We’ve given you everything,” Rajehs told them. “Why do you want to kill us?” But even as they were rolling down their windows to hand over their valuables, he knew that the robbers would likely force them out of the van and shoot them one by one. “We don’t need it!” a robber screamed, throwing the Bible down. A mile and a half ahead of them on the road, Pastor Faisal and the rest of the team waited nervously in the first van. They could not see what was happening behind them, but they knew something was wrong. Robberies like the one Faisal’s team experienced are just one of the many dangers Bible distributors encounter in hostile parts of the world. Faisal’s team spends several weeks each year delivering free Bibles to believers across Pakistan who otherwise would not have access to one. These workers seek out Christians who do not have a Bible, relying on local contacts to provide the names of those who need one. Most of those receiving Bibles are new to the faith. With each trip, the team travels farther afield. Just before being robbed by the bandits, they had distributed more than 700 Bibles to believers among the Sikh people in the ancient Hindu city of Nankana Sahib. When 9-year-old Jovia Mulungi opened her Bible for the first time, she knew it would change her life. Even at her young age, she understood that God’s Word and the life lessons it contains would set her on the right path. 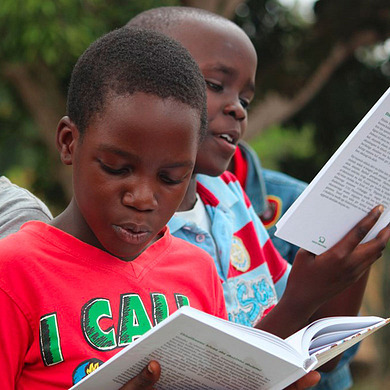 VOM distributes children’s Bibles in rural parts of Uganda, where Islam is spreading rapidly and Bibles are rare even among adults. Parents there are thrilled when their children receive their own Bibles. 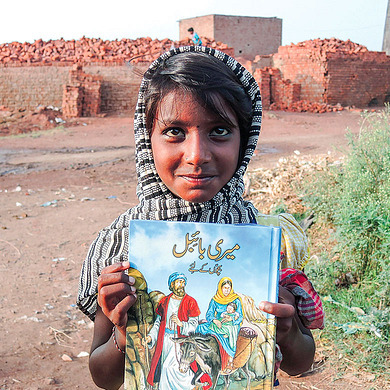 As the Bibles were distributed to a group of Christian children, some nearby Muslim children asked if they could have a copy, too. Members of the distribution team happily gave them each a copy of their own. After several boxes packed with 200 Bibles were strapped to its back, the donkey and its handler headed for the Syrian border, hoping to make it through security and into the war-torn country. They had previously used the same route to smuggle 50 Bibles to a group of Syrian believers, but more Bibles were needed thanks to the growing number of Muslims turning to Jesus. When they arrived at the border checkpoint with their cargo of 200 Bibles, they were turned away by armed guards. But instead of conceding defeat, the donkey’s handler took a calculated risk: He led the donkey along the border until they were out of view of the guards and then quietly sent the donkey across the border by itself. The donkey already knew the rugged mile-long path into Syria and had been rewarded with a candy bar on its last trip, so the handler was confident that it could make the trip without his help. 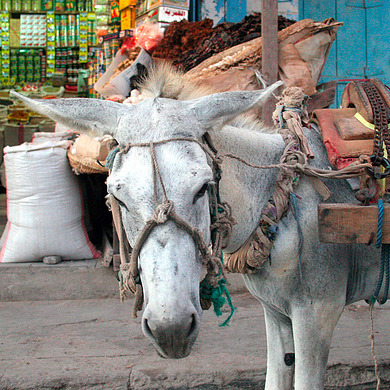 And since donkeys transport all kinds of goods across the border, including contraband like drugs and weapons, the pack animal wouldn’t look suspicious. Shortly after the donkey crossed the border alone, the handler received a text message from his contacts in Syria — shipment received. “It’s the most unique Bible smuggling story I’ve heard,” a VOM worker said. But as unusual as the story is, the truly amazing aspect is the growing demand for Bibles coming from former Muslims in Syria. How many Bibles will You Sponsor?